October 2014 – Teach. Brian. Teach. With circuits this year, I’ve been teaching a “solve for everything” approach that balances circuit reduction with reasoning about Kirchoff’s rules. First students reduce the circuit and then work to determine the current, potential differences, and power outputs of each device. 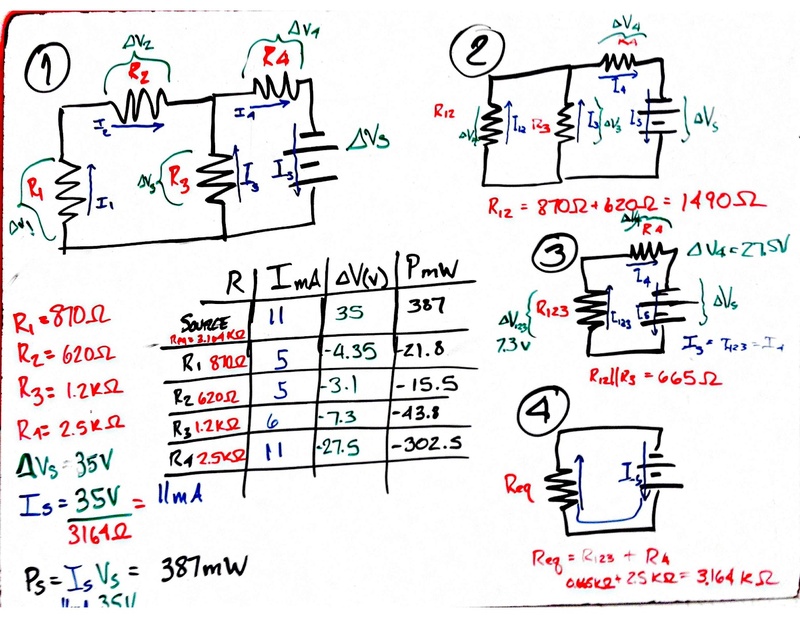 For example, on the student whiteboard below, they were supposed to find the power output at Resistor Three. I’ve been pushing for solving for the power input/output of everything, so they can check energy conservation. I worried about teaching them to use the table, that maybe it would turn it into a mindless numbers game, but the organization actually allows students to spend energy on reasoning for how currents / potential differences should relate. It also just helps with the book-keeping so keeping track of what they know and don’t know easy. It also makes checking work easy. The first two columns should multiply to the third column by Ohm’s Law. And the 2nd and 3rd columns should multiply to the 4th column by the power relationship. A colleague of mine extended my table method to include all the equivalent resistors along the way as well. Overall, I’m pretty happy with this approach. One tweak I would make would require them to write/diagram their reasoning about how the Kirchoff’s reasoning–either in algebra or using the diagrams. I thought I would dig a little deeper, and do just a quick survey of all articles published in Physical Review–Special Topics in Physics Education Research, which touched upon gender, participation, or highlighted international research. I should note that the list below is based on titles only–I didn’t read the abstracts or the papers. While this isn’t a thorough analysis, it paints a slightly less bleak picture than one paper published almost a decade ago. The authors post has made me pause to think about our priorities and prodded me to dig a little deeper into the data to see what the situation is beyond just trusting Carl’s Wieman’s comment and a quick examination of just two research groups. Note 2: I also added relevant presentations from most recent PER Conference. The Impacts of Instructor and Student Gender on Student Performance in Introductory Modeling Instruction Courses by Daryl McPadden, Eric Brewe. The Long Term Impacts of Modeling Physics: The Performance of Men and Women in Follow-on Upper Level Physics Courses by Idaykis Rodriguez, Eric Brewe, Laird H. Kramer. If you feel I missed an important Physical Review paper or PERC 2014 presentation, let me know in the comments. Logic and Reasoning– Tools for Empowerment or Coercion? As I’ve talked about before, Physics Licensure I and II are very much a band-aid sequence of courses for our future physics teachers–helping students to develop the reasoning skills and conceptual understanding they didn’t have much opportunity to learn our introductory physics sequence. Students are really struggling with reasoning about Newton’s Laws. The course, being a band-aid, isn’t really providing the right kind of opportunities either. We go through tutorials each week, students do tutorial homework, and they have to write brief reflections each week. In addition they work some AP physics problems, and they have to make ongoing concept map to make connections among what they are learning. In all that, students get a fair amount of practice building concepts and reasoning, but they don’t get enough opportunity to explore and grapple with actual phenomena. We’ve encountered many days where students seem to follow along with a guided line of reasoning stemming from Newton’s Laws (not easily). At the end of it, someone will say, ‘That makes no sense”. In that, they are understanding and can produce the logic of the argument, about how if N2nd Law and N3rd law are true, it implies that some other conclusion must be true. To students, N2nd and N3rd law are not ideas they “own”; they aren’t using these ideas to discover puzzling implications about the world. Rather, the guided reasoning they are asked to follow coerces them into concluding things they’d really rather not say and definitely don’t believe. They aren’t happy about it. My sense as a instructor is that many of our students still largely think that force is in the direction of motion, that you have to push harder than friction (or up against gravity) to keep an object moving steadily, that pushing harder will result it moving faster. Sure, you can remind them of Newton’s 2nd Law, and they can be coerced into saying something more correct, but it’s definitely coercion. That’s how we’ve gotten to the place where students are saying, “I think I learned nothing in Physics I”. These students need a lot more experience with phenomena and grappling with their own ideas, the ideas of each other, etc. Right now, I don’t think I’m providing what they need.